I agree with your last post. When you write like that, you are quite cogent and informative. Please always take a deep breath when you reply and continue with this kind of enlightening, edifying comment. Franklin Graham has been known to put his foot in his mouth from time to time. Billy has always gone out of his way to not give offense to any other Christians. I once heard that Benny Hinn was Orthodox at one time. Does anyone know if thjat is true? And what about that Greek guy Dino (looks like a white Michael jackson) who plays the piano on TBN? What's up with him? He is a Lebanese man who was baptized Antiochian as a child. I believe he was adopted by a Canadian family, whereafter he drifted away into his little Charismatic fancies. He affirms Nine Persons in the Trinity (which would actually make it an "Ennead"). 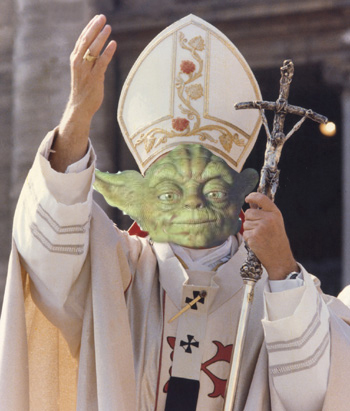 I think he would be more like the Pope of DisneyWorld. I love your reply Beavis. Is there a connect to a website that talks about his fanasy trinity. I could use more laughs. My bad.....he is actually Palestinian. I suppose, after seeing some of those links and also reading about Benny Hinn's outlandish heresies, at the risk of contardicting myself, some things/people are deserving of ridicule - there seems to be no other sane response to them. Nonetheless, ridicule is dangerous and must only be applied with a scalpel, not a broadsword. In other words, with discernment and only when no other response - including silence - is appropriate. It's pretty sad how petty you guys are getting. While I disagree with Pat Robertson on a lot of stuff, and think he puts his foot in many ofirices on his body, I think broadbrushing evangelical Christians is pretty lame. Not to mention, not very Christ-like. Has any of you prayed for him or Mr. Hinn, or are you too busy thinking of the next cutting remark you can say about them. Do you really think all evangelicals are like them? If so you are very mistaken. A lot of us are concerned about the same issues you are-abortion, moral standards plummeting, poverty,etc. We are not all holy laughing, feel-good worship-chorus singing, liberal minded, pro choicers. While I am on my soapbox, I will throw out one more thing. A lot of you claim protestants go to church and it's centered around making us feel good. At the same time, I see where a lot of converts to Orthodoxy say that the first time they went to an Orthodox church, it just felt right and felt like I was coming home. Kind of ironic, huh. Okay, I am done venting and will come down off my high horse now. Seriously, I am seriously investigating the Orthodox faith and am drawn toward it. I even agree with a lot of the doctrines now that I have investigated what they really mean and are based on. Sorry if I offended anyone, just felt like I had to say it. My tone was probably not good, and the broadbrushing I refer to is not all in this thread. This was probably not a good thread for me to post to as I am struggling with my faith right now, and am trying to be more Christ-like. I apologize for my tone in the post. No problem, Serb. I think you and I just got off on the wrong foot. I am not as pious and self righteous as I sounded. Look forward to posting with you in the future in a better way. huh? How on earth did you come to that conclusion? I've certainly never thought of Evangelicals as being "liberal" or "pro-choice"...quite the opposite. I've never felt more "free" and uncondemned to be a political free thinker as when I joined the Orthodox Church. I think it was that he was writing in heated thought and meant to say conservative pro-lifers. I actually meant it the way I wrote it, but meant it from a theological viewpoint. I have seen a lot of ex-Protestants on this and another forum say they converted because their Protestant churches were to liberal doctrinally, denying the Trinity, being pro gay marriage, gay priests, etc, and a politically correct, watered down Gospel being preached, etc. ahhhh, yes Searching. I know what you mean. But these Protestant Churches generally are mainline ones which have gone astray. Particularly Lutheran, Reformed, Presbyterian, Methodist, and Anglican. The ones which I think we are "picking on" in this thread are ones which may be conservative in theology but have certain other unsavory elements to it, such as the self-righteousness of Pat Robertson and the looniness of Benny Hinn. I mixed points about picking on them specifically with picking on Protestants in general into one overly self-righteous post, didn't I? I still think Pat and Benny need to be prayed for more than ridiculed, but like they say for the free-for-all forum, be ready for some polemic discussion. I don't consider Benny a Christian at all, and I live where Pat is based, so I get to see some of his good side. He's not all bad, he just speaks without thinking. He does a lot of mercy ministries where medical assistance is sent to poor countries, etc. So I don't think he steals all the money that's sent in, like Benny Hinn might do. And I don't think he's in the same class as far as preaching weird, off the wall doctrine. But I can agree that he's a very abrasive dude. When he commented about needing to assasinate the Venezuelan president, some people I talked to thought even though it was stupid to say, it really was true. In other words: he says what our government thinks and is too timid to say. Not very Christian of him, was it? Actually, I find nothing intrinsically wrong with what he said. After all, we wouldn't harp on any Christian leader during the '40's for saying that Hitler needed to be assassinated. It's an objective moral fact: some dictators need to be assassinated to save the lives of potential genocide victims. My only problem with it, however, was his specific choice. I mean, when it comes down to it, nearly 2/3 of the collection of world leaders need to be assassinated for that matter. Why did he narrow it down to this particular one? To me it all sounds like part of his political agenda. I find it interesting that he never called for the assassination of any FASCIST dictator. He seems to have no problem at all with fascism. He only seems to find problems with MARXIST dictators. His choice of who needs to be assassinated and who doesn't seems to be clouded by his ultra-rightist views. But that said, I do not find any problem with stating that a heinous dictator should be assassinated. As unappealing as Chavez is, he has been democratically elected, is well-liked by all Venezuelans I know, and even survived a recall vote that was recognized as fair by respected institutions. I think there is some possibility he could become an authoritarian leader--he's certainly a demagogue--but calling him a dictator in need of assassination is just silly. When I started this discussion, I didn't realize that it would take on a life of its own for so long. But I have enjoyed reading the comments and responding. And a welcome to Searching who is well searching. ARen't we a motley lot. But then that's Orthodoxy. Dude, this is an internet message board. Never assume anything.